In March 1916 the 13th (Forest of Dean) Battalion Gloucestershire Regiment were posted to northern France. A few weeks later William Britton, of Bristol, completed his basic training and was posted to the 13th. He likely joined the Battalion in France, as a member of 'D' Company, with a draft of men arriving in May. By November 1916 the 13th Battalion were in the Ypres area in Belgium, where they remained throughout 1917. The 2/6th Battalion Gloucestershire Regiment were west of Arras in July 1917, but at the end of the month moved to northern France. 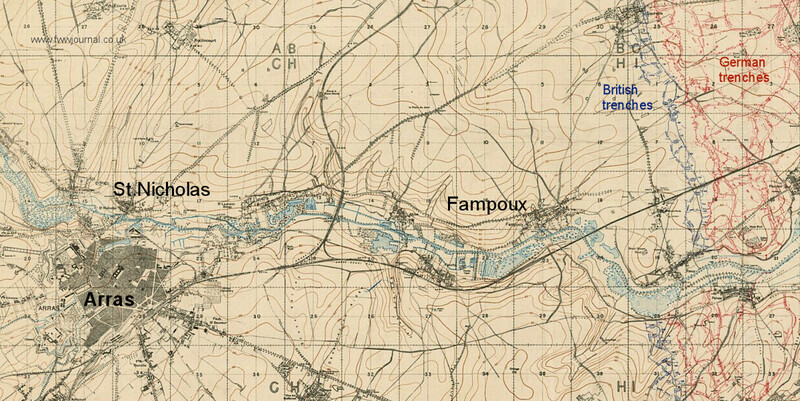 From here, in mid-August, they moved to the Ypres area where time was spent in training. Mid-September they were once again on the move; heading back to northern France first, and a day of rest, then on 18 September they entrained at Cassel station bound for Arras. It is probable that when both the 13th Battalion and 2/6th Battalion Gloucestershire Regiment were in close proximity near Ypres, August-September 1917, that William Britton transferred from D Company 13th Battalion to A Company 2/6th Battalion. Trench map from November 1917. On arrival at Arras the 2/6th Battalion marched approximately 7 miles west to billets in Simencourt. Having rested and completed a few days training they marched to Hull Camp, at St. Nicholas, near Arras. In the latter part of September, they were working in the support trenches under the Royal Engineers; then on 30 September the Battalion forward to the front line trenches, relieving the 2/4 Battalion Gloucestershire Regiment. Following a few quiet days they in turn were relieved and returned to Hull Camp. There followed another period of rest and training, before returning to support trenches as working parties, then back to front line trenches on 22 October. 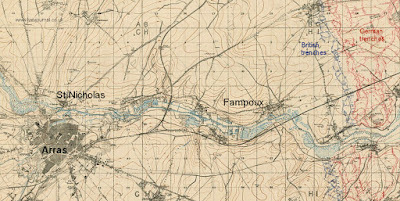 The latter part of October saw British trench raids and retaliatory action by the Germans, resulting on 23 and 24 October in 2 men killed and 9 wounded from the Battalion. Artillery fire also caused considerable damage to the Battalion's trenches. Following this there were a few quiet days, after which the Battalion was relieved and they moved back to support trenches on 28 October. For some, this respite from the front line trenches was to be brief. Quiet day. Some retaliation in evening, as a result of a raid made by Battn. on our left. 1 O.R. Killed. 2 O.R. Wounded. Born 1888 at Painswick, Gloucestershire, England, the son of William and Eliza Ryland. The Gloucestershire Echo of Tuesday 6 November 1917 includes Corporal Myhill in a list of local men awarded the Military Medal. Born 1887 at Great Yarmouth, Norfolk, England, the son of Albert and Amelia Myhill.